The first nomination for this winter’s NPA elections has been received. “A growing and demanding human population continues to create challenges for us all regarding food production and security, so being given another chance to be part of helping secure trust, in these uncertain times for the British farmers, businesses and families in the pig industry, helping secure a sustainable future food supply chain for all, would be a privilege,” says Simon Davies, of Meadow Quality. A further three nominations for Allied Industry Group have been received and these nominations will be valid as soon as the candidates’ election addresses and head-and-shoulder pictures have been received. In addition the first nomination for Producer Group was received this week, and this too will be published, as soon as the candidate’s election address and head-and-shoulders picture has been received. 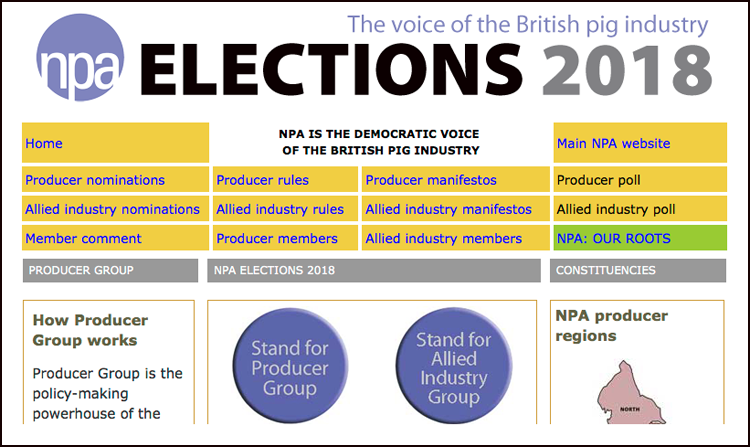 This bespoke site gives details of the 2018 Producer and Allied Industry Group elections, including election rules, on-line nomination forms, and encouraging guidance by previous and existing members. Are you thinking of standing for election? Nominations are open until January 8… but the sooner you get yours in, the greater the opportunity for members to read your election address, and decide you’re exactly the sort of person NPA needs! “Election addresses are an integral part of the process. They help members all over the country decide who they’ll vote for when the online polls open on January 22,” said NPA chief executive Zoe Davies.